V Card Nightlife Pass discounts - Hotels Etc. V Card Nightlife Pass The V Card is the Ultimate Vegas nightlife pass! This card gives you VIP Entry/Access and Free Admission to the hottest Night Clubs in Vegas. Why wait in those long general admission lines when you can be in the VIP line? The V Card is your one stop shop for nightlife in Las Vegas. Not only do you receive complimentary VIP admission to the best nightclubs, you can also take advantage of exclusive offers such as free drinks and dining discounts. Clubs include TAO, Pure, LAX, LAVO, Coyote Ugly, and many others. Special Offer: Save over 20%! 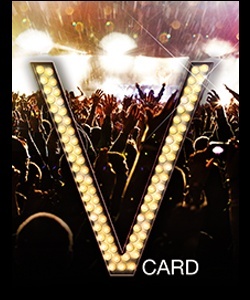 V Card Nightlife Pass The V Card is the Ultimate Vegas nightlife pass! This card gives you VIP Entry/Access and Free Admission to the hottest Night Clubs in Vegas. Why wait in those long general admission lines when you can be in the VIP line? The V Card is your one stop shop for nightlife in Las Vegas. Not only do you receive complimentary VIP admission to the best nightclubs, you can also take advantage of exclusive offers such as free drinks and dining discounts. Clubs include TAO, Pure, LAX, LAVO, Coyote Ugly, and many others.